I want kids engaged in creative, joyful learning. I wouldn't mind if they knew a little grammar too! 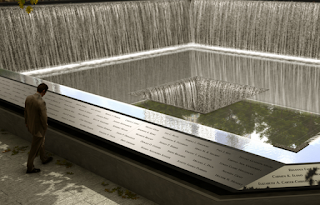 Read "The Names," a poem about Sept. 11 by Billy Collins and then read the _HuffPost_ article about Sept. 11 first responders. Which text had a greater effect on you and why? Was that effect emotional or cerebral? Explain your answer in a paragraph, citing specific proof from the text(s). The assignment enabled me to broaden students' knowledge about September 11, expose them to poetry, and test them on skills I want them to develop, such as the ability to analyze their own response to what they're reading and to use proper textual proof in their arguments. The slideshow culminates with Maya Ying Lin's Vietnam Memorial and the 9/11 Memorial, so students are able to see that the emphasis in war has shifted from the celebration of a leader's exploits to the mourning of the loss of the common soldier or civilian. This shift represents a radical change in view about what and who is important in battle. 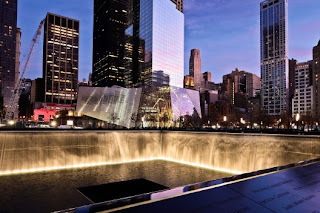 The lesson on the 9/11 Memorial also allows me to introduce the concept of the use of water and landscape elements in the design of an architectural environment. For example, the deep abyss into which the water in the 9/11 Memorial falls reminds the viewer of the awful way the victims perished, but the water also represents rebirth and renewal. The trees surrounding the waterfalls are additional symbols of rebirth and renewal: they are all deciduous and so shed and grow leaves in the fall and spring. The landscape designer used, as well, trees from Washington, D.C. and Pennsylvania, in order to include all victims of the day in the New York memorial. The slideshow linked above has more information about this moving tribute to the victims of September 11. I'm Chief Academic Officer at Magen David High School in Brooklyn, NY and an advocate of passion-based learning. I co-Founded and am Director of the I.D.E.A. Schools Network, which helps Jewish and independent schools implement project-based learning and educational innovation. Check out our website at ideaschoolsnetwork.com, and watch my ELI Talk on passion-based learning at http://elitalks.org/why-we-need-passion-based-learning-jewish-education!